Did you slip and fall at a business or on another's property? From the shops to the restaurants to the crowded streets and sidewalks of Michigan, Baldwin Legal Services PLLC provides aggressive and effective representation to recover compensation for people who have suffered a severe personal injury due to a slip and fall or a trip and fall on an unsafe and dangerous premises, whether the accident occurred on private or municipal property. 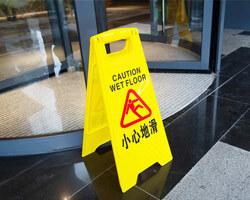 Slip and fall accidents are one type of premises liability cases. They typically occur when unsafe conditions cause a person to slip or trip and fall. Michigan property owners have a legal obligation to ensure that their property is safe and properly maintained. This duty may include a responsibility to make reasonable, periodic inspections of the property and to repair or remedy any dangerous conditions or post an adequate warning about any danger that is not obvious. For instance, a recently-mopped floor can be hazardous to walk on, but it may not be obvious that the floor is wet unless a sign is displayed. Wet or slippery floors, which can be caused by water leak, a spill or excess rain. Bad flooring conditions such as broken tile, uneven flooring panels, torn carpeting, cracked pavement or potholes. Poorly-lit staircases, garages or parking structures. Foreign objects that block or obstruct a pathway. Weather conditions such as icy patches caused by snow. Even though this may be out of the property owner’s control, he/she is still responsible for ensuring their walkways are safe and can be held liable if icy patches are not cleaned properly or marked with caution signs to warn people of the potential dangers. Proving the property owner's liability usually requires proving that the property owner knew or should have known about the dangerous condition but did nothing to prevent it. This is not always an easy matter. Take the case of a food or drink spill in a grocery store or restaurant-the spill may be caused by a worker or a customer, and the management may not be immediately aware of it. How long is it reasonable for a spill to stay on the floor before it is cleaned up? How do you prove how long the spill was there before the accident occurred? These questions can be answered, but it may require proving a case with expert testimony and circumstantial evidence. Our lawyers are skilled and experienced in handling such matters and know how to properly investigate and prepare a case of premises liability. Another important aspect of the premises liability case is determining who the responsible party is. Is it the property owner, the property manager, or a lessee or renter? If the accident occurred on a sidewalk, is the property owner or the city responsible? If a person trips because the sidewalk and curb were uneven, who is responsible? Your case may settle outside of court or may be resolved in a court of law by a judge or jury. You could also potentially take action not just against those who own property, but also against tenants or renters who were in control of the space and who allowed unsafe conditions that led to a slip and fall. The personal injury attorney of Baldwin Legal Services PLLC has served the needs of accident victims in complex negligence litigation. If you need advice about your legal options after a slip and fall accident in Michigan, please call 877-886-1441 or contact us online to schedule a free consultation. Like other personal injury cases, having the right evidence can make or break a slip and fall case. For instance, if you suffered a bone fracture after slipping on a sidewalk, it's important to get pictures of the area so that we can prove a significant defect was present and contributed to your slip and fall. Unfortunately, it can be very easy for people to dispose of the evidence, especially things like ice and snow. If there was a construction or design defect, defects can be fixed before victims and attorneys have the opportunity to investigate. The single most important thing you can do is contact us as soon as possible after your injury so we can begin investigating. Get medical help as soon as possible. Your health should be your number one priority. Plus, you will need to have your injuries documented to receive compensation for your medical bills. Immediately report the accident to the store manager, landlord, homeowner, or person in charge of the facility where you fell. If you fell in a business or on a rental property, the manager or landlord should take a report of the accident. If you are busy being treated by emergency medical personnel, call back to make sure they recorded an accident report. Obtain a copy of any existing slip and fall accident report before leaving the scene, even if the accident was documented by someone other than a police officer. If you slip or trip and fall on a homeowner's property, limit talking to them as much as possible. You can tell them you fell, but don't get emotional or angry. Avoid arguing, and focus on the most important thing – getting treatment for your injuries. Take photos of the exact location where you fell, and of any conditions that may have contributed to or caused your slip and fall accident. Take notes of any conditions, the time of the accident, etc. These photos are very important to determine who's to blame (depending on who owns the property) and the condition that caused your injuries. For example, a homeowner could shovel and salt his or her sidewalk within hours of your slip and fall accident; if there are no photos proving that the sidewalk was untreated, it can be hard to prove your slip and fall case. If you fall on a sidewalk close to a property line, it's important to know exactly where you fell, and on whose property. Collect the names, addresses, and phone numbers of any witnesses. Place the shoes and clothing that you were wearing at the time of the accident in a safe storage place. Contact an attorney before you talk to the insurance company or sign any papers. Otherwise, you may give up your rights to be compensated for pain and suffering, medical bills, and lost wages. Many insurance companies offer to pay your medical bills and want you to sign papers that basically state you will not file a claim against them. However, these "medical bills" may be for initial treatment only. What if you will need surgery? What if your injuries are permanent? What if you have missed work time? The bottom line – contact Baldwin Legal Services PLLC, before it's too late. The insurance company wants to settle your case as soon as possible – and for as little money as possible. Our personal injury attorney has a Master of Laws (LL.M.) in Insurance Law and knows how to protect you from the insurance companies and to present your claim in the best way possible to ensure your rights are protected and that you get the maximum compensation available. Recovering your damages starts with an evaluation of your case. Please call 877-886-1441 or contact us online to schedule a free consultation. We are available 24 hours a day and 7 days a week. Home and hospital visits are available upon request.